UNITED NATIONS — The impending launch of a North Korean ballistic missile has as much to do with the propaganda goal of putting a satellite into orbit as to serve as a less than subtle bullying to neighboring states all undergoing a period of political transition. Though Pyongyang has forewarned regional governments about the rocket test, the real impact of the launch may impact on the policies of South Korea, Japan, Mainland China, and the USA. Lost in most media discussion over the quaintly titled Democratic People’s Republic of Korea’s (DPRK) capability to launch a ballistic missile is the frightening political fallout on Japan’s parliamentary elections on Dec. 16, South Korea’s presidential election slated for Dec. 19, the still nervous aftermath in China following the recent Communist Party Congress, and the transition period leading up to the presidential inauguration in the USA in late January. Add the first anniversary of the death of North Korean dictator Kim Jong-Il on Dec. 17, 2011 and the elevation of Kim Jong-Un as the new ruler and there’s a fascinating symbolic timeline. North Korean missile launches are nothing new and are often an embarrassing fizzle-out as was a high profile test this past April. Still the DPRK’s missile launches have been banned by the UN Security Council resolutions who fear the technology has less to do with putting satellites orbit than perfecting the means to carry North Korea’s small arsenal of nuclear warheads to earthbound targets. Neighboring states are ruefully reminded that North Korea is armed, and perfectly capable of playing the regional bully. Needless to say governments in Seoul, Tokyo and Washington are wary, but so too is Beijing and even Moscow. China’s Foreign Ministry said it was deeply concerned over the move but urged calm saying “North Korea has the right to the peaceful use of space, but that right has been restricted by UN Security Council resolutions”, those dating from 2006 after a previous rocket launch. Despite the ideological pedigree between the People’s Republic of China and DPRK, modern China for the most part is acutely embarrassed by the moribund Marxist monarchy and fears destabilization from this rogue regime. Given that North Korea mirrors Mainland China during the so-called Cultural Revolution, a period most Chinese would rather forget, having a nuclear armed and bellicose neighbor is bad for business and regional stability. 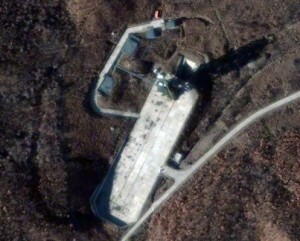 As it stands, Pyongyang plans to conduct the launch between Dec. 10 and 22. The flight trajectory is expected due south over the Yellow Sea and down past, Okinawa, Taiwan and the Philippines. Clearly the North Korean message is especially aimed at pressuring South Korea and Japan; to gain regime survival through humanitarian aid and “respect.” Ironically a launch may backfire politically though by helping elect South Korea’s conservative presidential candidate Park Geun-Hye and re-electing Japan’s centrist/status quo Liberal Democratic Party (LDP). Still while the Pyongyang regime has chosen between nutrition and neutrons, this is no less dangerous especially for Japan and the USA who must contend with a nightmare scenario that a desperate and unpredictable North Korea could someday use nuclear weapons against two countries Washington is treaty bound to protect; Japan and South Korea. In February the Obama administration and North Korea signed an agreement in which Pyongyang pledged to suspend its missile and nuclear proliferation in exchange for humanitarian aid. Months later, Kim Jong-Un snookered Washington with the attempted, if unsuccessful, missile launch. Naturally any new launch will trigger a return to the UN Security Council where sanctions will be debated but likely softened by China. But will Beijing’s new ruler Xi Jinping show his erstwhile comrades in the DPRK the same grudging deference as Chinese leaders have in the past?